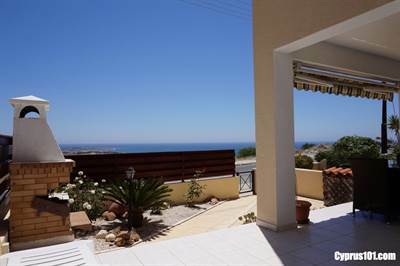 This spacious 3 bedroom Chloraka semi-detached villa for sale has stunning panoramic sea views and is located in a popular area very near the coast road between Paphos and Coral Bay. The property is spacious throughout and has good quality, modern finishes with many extras such as double glazing, fly screens, ceiling fans, air conditioning and much more. The ground floor features a light and airy living room nicely divided into a comfortable lounge and formal dining area. To the rear is a guest cloakroom and doorway to an impressive stylish kitchen with granite central breakfast bar. There is access from here to the rear driveway which has space for two cars. Upstairs are three double size bedrooms, all with fitted wardrobes and two with private balconies. The master bedroom has en-suite facilities and off the landing is a family size bathroom. The coastal views from the master bedroom are breath-taking and it’s a joy to sit and watch the beautiful sunsets. The outdoor leisure space includes a raised covered veranda with fitted awning for when additional shade is required. At the lower level is a patio area with fitted barbecue and easy to maintain landscaped garden. Fencing provides privacy from the road, but does not impede the lovely views. The complex has a well maintained swimming pool with spacious sunbathing terrace and whilst relaxing you can enjoy the beautifully landscaped gardens surrounding. This Chloraka semi-detached villa is suitable as both a permanent residence and/or holiday home. It’s in excellent condition and has been well cared for by the current owners. Furniture is included and there are full title deeds.